This shows the west end of Nevile's Court at Trinity College, Cambridge, with the college library built by Christopher Wren. After creating the Great Court at Trinity College, the college master, Thomas Nevile ambitiously sought to build a new court to the west of the Great Court, at his own expense. His building work was completed in 1612. It was an cloistered courtyard with a gabled roofline. 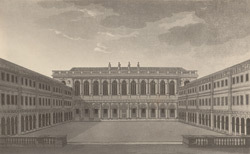 The fourth side of the courtyard was finally completed by Wren's library, built between 1676-1690. It built of creamy Ketten stone with a pinkish hew. The ground floor is an open arcade - built to match the pre-existing cloisters built by Neville. The library is on the upper floor. The columns used are Tuscan columns.